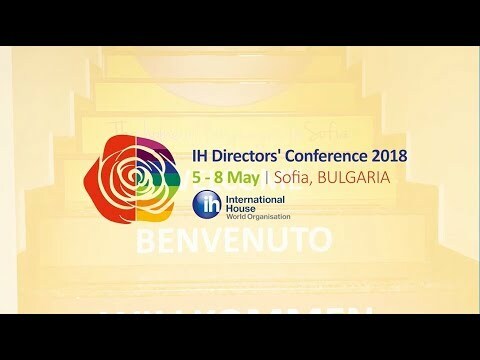 International House directors and partners from around the world have just returned from a bumper edition of the annual IH Directors' Conference. This year the event was hosted by IH Sofia in the Bulgarian capital, and the team welcomed nearly 150 delegates to their city - one of the largest IH conferences for some years. The Grand Hotel Sofia saw an action-packed few days of discussions, workshops and networking events, covering a wide range of topics, from marketing and student welfare to teacher training and school administration. Guest speakers included Loraine Kennedy; Jacqueline Kassteen from Jackfruit Marketing; Keith Kelly from Anglia School; and Genevieve Abela and Nicoletta Pinto from Guard.me. Sessions were also lead by members of the International House network, with discussions on a variety of subjects ranging from school innovations and customer experience to social media and online learning. IH World's Executive Director, Monica Green, said "our annual Directors' Conference is central to our work with our members throughout the year. Not only do we get to meet up and exchange news, swap views and enjoy ourselves in excellent company, but we look forward together towards what IHWO can aspire to achieve in the coming 12 months and lay some of the ground work. This year's conference in Sofia was very well attended and we had some very interesting sessions from both IH and external speakers. I would highly recommend Sofia to anyone who hasn't yet been there - the city's warm welcome underpinned our success." International House was proud to be joined by some fantastic sponsors this year: Amber IT Solutions; BEBC; Cambridge Assessment; Cengage National Geographic Learning; Euroexam International; Guard.me Insurance; PeopleCert; and Trinity College London. A lively city tour on the Saturday afternoon was followed by a glamorous opening dinner at the Sofia Military Club - a grand, historical building in the city centre. Sunday evening saw the exciting annual charity auction take place, which was a huge success again this year. Nearly €7,000 was raised for local charity, The Cedar Foundation, through bidding and raffles. Our wonderful hosts, IH Sofia, welcomed us to their school on the Monday evening for a quiz and some delicious home made Bulgarian bites. The conference finale came in the form of a vibrant closing dinner at The Happy Village - a traditional Bulgarian restaurant with local music and folk dancing. Simon Harris, Managing Director of IH Sofia said, "we loved having everyone here in Sofia for the conference and really enjoyed the opportunity to show off our city. During the event, the innovative themes and topics opened up some great ideas, so we’re looking forward to hearing how many of these are implemented over the next year. I must add, we have lots of beautiful mountains and beaches in Bulgaria should anyone wish to return!" A photo gallery of the IH Directors' Conference can be found on our Facebook page. A huge thank you to the team at IH Sofia for their incredible support and to all our sponsors for joining us this year!